A heated, Olympic size, eight-lane swimming pool affords a breathtaking view of the mountain, soccer field, Aghia Paraskevi, and city of Athens. 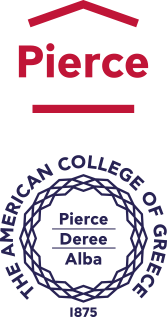 The pool facility is a “shared use” facility with Pierce and Deree academic and non-credit classes. Trained lifeguards are always on duty when the facility is open. Newly renovated locker/shower rooms, with separate areas for men, women, boys and girls allow the Aquatics Facility to be used on a shared use basis for classes, athletics, recreation, and leisure. Popular aquatics activities include fitness and swimming classes, varsity, water polo, and lap swimming. Long course: The swimming pool is normally set up long course to accommodate competitions and those who enjoy the serenity of long swims. Short course: From time to time, the orientation is changed to short course style (lanes going across the width) to allow for more activities and classes. Dive-in-movie: Student Government, professors, departments and other organizations are encouraged to use the swimming pool and deck for meetings, classes, events and socializing. Summer Camp: Each summer the College sponsors a Youth Summer Camp for campers aged 6 to 14 years old. In addition to the children’s favorite activity of swimming, the camp offers tennis, soccer and other sports activities in the morning complemented by fun academic classes in the afternoon. 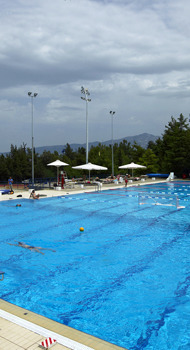 Physical Education ‘Academic’ Classes: Swimming and Water Fitness are offered as Physical Education classes for academic credit. Physical Education ‘Non-Credit’ Classes: Aqua Aerobics classes are provided for recreational purposes.